Snakes, spiders, jellyfish, and scorpions are just a few examples of venomous animals. Being venomous provides several advantages; it can be used to catch the next dinner, or as protection against larger predators. But how did these animals become venomous in the first place? The designation 'venomous animals' covers more than 100,000 different species of reptiles, insects, mollusks, mammals, and more. However, this does not mean that all venomous animals originate from a common, venomous ancestor. Actually, the ability to produce venom is usually a result of random mutations that provide a species with an advantage. Typically, new abilities arise as a reaction to changes in the environment – for instance changes in the climate or insufficient prey or other resources. Individuals with new mutations may be naturally selected, if they are better suited to manage the current challenges in nature. The natural selection of advantageous mutations is the cornerstone of Darwinian evolution theory, whereby altered conditions in the environment exert a 'selection pressure' on the population of animals. For this reason, animals can sometimes evolve the same type of ability independently, as they adapt to similar environments even when far removed from each other. This phenomenon, called 'convergent evolution', is observed by the presence of venom in many distantly related animals. For example, bees and snakes can both inject a unique venom into their prey or victim as a means of attack or defense. Coelenterates, such as jellyfish, are the oldest examples of venomous animals that we know of and date back as far as 600 million years. In comparison, spiders and scorpions have existed for 400 million years, whereas advanced snakes have been around for 'just' 54 million years. In spite of being the younger contender, snake venom is the most heavily investigated, due to the medical importance of snakebite envenoming: Each year, snakebites kill more than 100,000 people around the world. Venom is thought to have evolved by the copying of certain genes, which encode relative harmless proteins. These gene duplicates acquired further mutations that conferred toxicity and gene expression in a specialised venom gland. So, while it is the same gene, the function is very different. This process, whereby a gene duplicate obtains a new function in this way, is called neofunctionalization. One example is the enzyme serine proteases. These enzymes catalyze the cleavage of various clotting factors, which make the blood coagulate and prevents injured snakes from bleeding to death. But in some snake species (for instance the Costa Rican Bushmaster), serine proteases has undergone neofunctionalization, which causes them to carry the normal serine proteases in their blood, but also serine proteases in their venom (along with other proteins) adapted for exerting toxic effect in prey. When the venom is injected, the serine proteases uses up all of the clotting factors in the prey's blood preventing it from coagulating and allowing the prey to bleed to death after a bite or another injury. If a new function from an old gene provides the snake with a survival advantage, the gene will be positively selected in nature, which is a form of adaptation to the ecosystem. When an animal becomes venomous, it cannot just 'lean back' and rely on the same venom forever. Prey and predators will over time develop resistance against the venom, and the venomous animals cannot afford to stop adapting. Their prey can, for example, become better at avoiding venomous animals through improved camouflage or faster reflexes. But also, mutations in the prey's target molecules, which the toxins attack, for example the receptors in our peripheral nervous system, can make the prey more resistant through natural selection. Prey and predators compete in never-ending arm wrestling, an arms race if you like, with small adjustments at the individual level that allow for selection of the animals best suited for surviving a venomous bite to pass on their genetic heritage through their progeny. Why are some animals more venomous than others? Perhaps you have heard people proclaim something like 'this snake has enough venom to kill 100 people.' But how is toxicity actually measured? The most venomous snake for humans is the Australian Taipan that has enough venom to kill 1,100 people. Of course, this has never been tested on humans! Instead, small amounts are tested in mice and from there it is estimated how it would scale to humans. These numbers must be regarded with caution, as toxicity is a relative concept and can vary significantly between species. For example, some snake venoms are much more effective against reptiles than mammals. This discrepancy might be explained by the fact that snakes with such venom benefit more from killing reptiles quickly, if they live in an area with many lizards for instance. Venom has thus proven itself to be a very effective survival tool, which naturally raises the question why aren't all snakes (equally) venomous? Some venoms become more potent due to a selection pressure that is mainly driven by foraging. Producing venom takes a lot of energy, and therefore it must result in more food for the snake, in order to be worth producing. The ability to be venomous can also disappear over time. This has happened recently in a species of sea snake, which changed its diet from fast swimming fish to immobilized fish eggs. Loss of venom has also been observed in pythons and (probably) anacondas, where constriction is now their main method of acquiring food. As venom becomes obsolete, no selection pressure helps preserve the venom production ability, and the snake species will lose this ability over time. Beside easier predation, venom can also be an effective defense strategy. If an animal injects painful venom when it is attacked, a predator will think twice before hunting it again. The sense of danger and the fear of being bitten, as predators experience when hunting snakes, can be passed on to their offspring, and this benefits both parties. Studies indicate that snakes have influenced the brain development of primates in this way. In experiments with macaque monkeys who had never encountered a snake before, stress response was measured while showing a picture of a snake or snake-like object. You may have seen the phenomenon on YouTube, where cats react strongly at the sight of cucumbers. It is possible that the cucumbers induce the same type of response in the brains of the cats that the snakes do in the brains of apes. Another study also showed that mice pass on responses to their offspring exposed when exposed to a certain smell followed by a very loud noise. In this way, the traumatic experience is transferred so that their offspring become anxious by the same smell that originally scared their parents. In the same way, one could imagine that certain visual stimulants, for instance the sight of a snake paired with a traumatic experience of the painful consequences of venom, could be transferred from parent to offspring. Interestingly, some non-venomous animals have developed a way to imitate the danger signals from venomous animals, which deter predators. A classic example is the milk snake that has a pattern very similar to the venomous coral snake, or the hoverfly that can be confused with a wasp. This cheap trick is very beneficial as it saves the animal from the extra energy expenditure of producing venom. Another way to save energy is to change the toxin composition of one's venom depending on the purpose: hunt or defense. This phenomenon has been observed in cone snails. Research have shown that there is still positive selection pressure on the venom of some snakes, which makes the venom of their species as a whole change and evolve. The selection pressure is partly due to climate changes and human activity that continuously change the ecosystems where snakes live. There are increasingly more humans on Earth, resulting in increasing urbanisation. This further increases the contact between snakes and humans. The snakes remain in their natural habitats and adapt as cities encroach. Snakes have also been observed to be migrating further north, as the world warms. 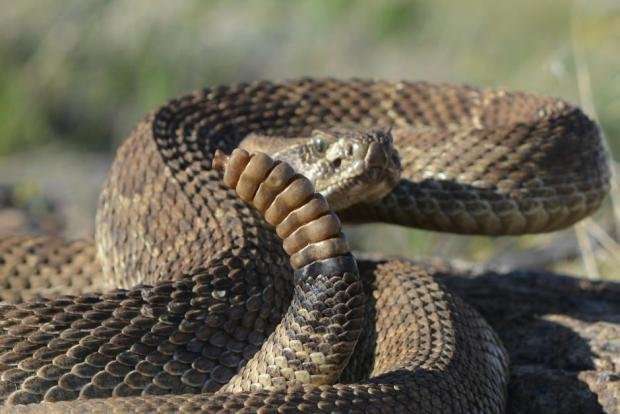 These developments could lead to an increased risk of snakebites in the future. Snakes must continue to adapt to their surroundings to survive. Whether the snake venom will become more potent, or whether the snakes will lose it all together, will probably depend on the specific geographic area and differ between snake species. On the molecular scale, research indicates that the individual toxins will develop in different directions; where some will undergo strong positive selection towards becoming more toxic, while others will lose their potency. Further studies of toxins will provide unique insights into how prey and predators are evolving to adapt to each other, and help us to better understand this molecular arms race.